Mark’s first silent film experiences started in June 1996 with Basel Sinfonietta and touring with six performances of the great Trauberg / Shostakovich film, ‘New Babylon’. For various reasons it was the greatest challenge to take on. After over 25 years of research and over 30 performances, Mark had managed to work out a definitive version by 2011 and recorded the fully uncut version for Naxos with Basel Sinfonietta, and a DVD (using Mark’s carefully cut and edited version to fit appropriately with the film) was issued in 2012 of the very successful live performance in the Teatro Verdi for the prestigious Pordenone ‘Silent Film Festival’. The sleeve notes and interviews with these recordings give a detailed explanation of what the problems were and why it took 25 years to work out a definitive version. Jan 2007, the project was repeated in Berlin at the Komische Oper and their orchestra. The rôle of Shostakovich was played in German by the actor Ulrich Matthes (particularly well-known for playing the part of Joseph Goebbels in the film ‘Downfall’ – 2004). At the request of the Komische Oper Mark (over several months) restored and edited the enormous and spectacular score for Jacques Feyder’s (1926) epic film ‘Carmen’ which portrays Merimee’s book in more than great detail. The music is by Ernesto Halffter (a faithful disciple of Manuel de Falla as well as a pupil of Stravinsky and Ravel). His music is stunningly original and passionate, with no trace of any Bizet. 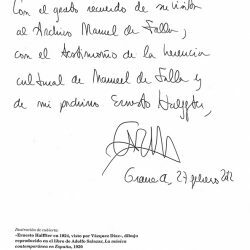 Mark was not yet aware that he was soon to form a rewarding friendship with Elena García de Paredes de Falla, niece of de Falla, god-daughter of Ernesto Halffter and custodian of the de Falla archives in Granada. 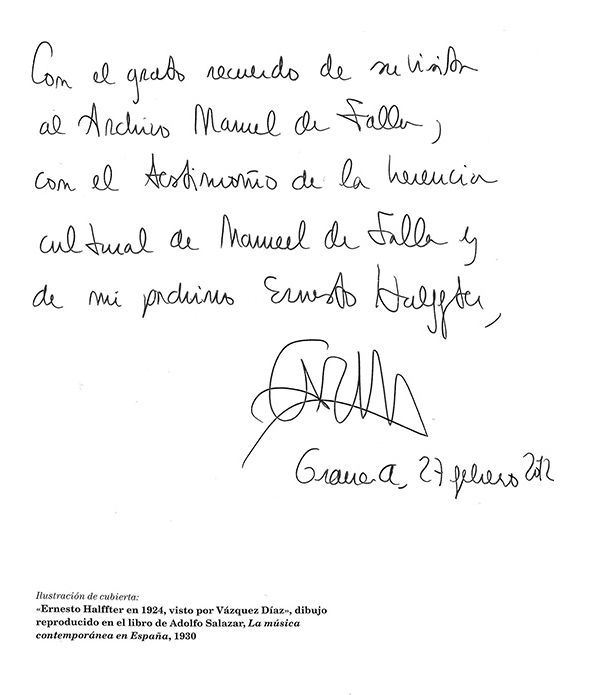 She was also to put Mark in contact with Ernesto’s son, Manuel Halffter in Madrid. It is understood that the November 2007 performance of ‘Carmen’ at the Komische Oper was the first to realise the composer’s full intentions. In November 2008 the film and score presented by Frankfurt RSO was recorded by Naxos making it a world première recording. For October 2009 further performances of ‘The General’ were again scheduled with Basel Sinfonietta. A wonderful surprise occurred concerning this film and its performances. After the Koblenz performance (12th July 2009) Mark was relaxing on the beautiful train journey (13th July) along the Rhine valley on the way to Strasbourg via Frankfurt. Unexpectedly his mobile phone rang ….. it was Carl Davis, who wanted Mark to discuss the forthcoming performances of ‘The General’. They met in Carl’s home in London (near Sloane Square) in July. The meeting was more than helpful and details of his new edits, tips for accompanying the film and the, at first, not obvious meanings of some of the melodies used in this wonderful and very effective score. Since this first meeting, Mark’s friendship with Carl and great respect for his music has continued to grow. In April (23rd, 24th, 25th) 2010, Basel Sinfonietta scheduled a new film for Mark to conduct with them called ‘Safety Last’ (1923), starring Harold Lloyd with music by Carl Davis who again invited Mark to go through the score with him. Travel by plane was completely suspended due to the Icelandic volcanic eruptions, and the dangerous dust that covered most of Europe. Mark was very lucky that Basel Sinfonietta were able to get the last place on the Eurostar (first class via Strasbourg) enabling him to be there in time for the first rehearsal on 17th April. In April 2011 Basel Sinfonietta performed 6 performances (including Luxembourg and Zug) of ‘New Babylon’ (in the definitive version) in preparation for the Naxos CD recording they were to make on 1st, 2nd and 3rd of May. On his way home after the Zug (6th May) performance, Mark stopped off to visit David Christie and his family in Zürich, to have a needed weekend rest. On the morning of the first day there (7th May), Mark had an urgent call from Carl. A double booking had occurred for Carl in March (2012). Several performances of the epic film ‘Napoleon’ in America were scheduled for the same period as 5 concerts with the Malaysian Philharmonic Orchestra in Kuala Lumpur. During the same period Mark was scheduled to conduct ‘The General’ in England, but Carl considered the Kuala Lumpur concerts should have priority. Luckily Mark’s ‘The General’ performance could be moved to the 11th March, (the day before Mark would have to travel to Kuala Lumpur). Carl’s agent, Hazard Chase, took on all the visa and travel arrangements for Mark. The first 3 ‘Tribute to the Beatles’ concerts, (23rd, 24th and 25th March 2012) consisted of all 22 of Carl’s popular orchestrations of the Beatles songs. The second series, called ‘Oscar Winners’ (31st March, 1st April 2012) starred vocalist Lance Ellington, (son of Ray Ellington), who has featured in many broadcasts, in particular ‘Strictly Come Dancing’. The programme featured nearly 20 Oscar-winning film hits such as ‘The Magnificent Seven’, ‘Moon River’, several ‘Bond’ films etc and ending with ‘An American in Paris’ (plus several encores including ‘Pink Panther’ featuring Stuart O’Byrne as the ‘Panther’). All these concerts were very well attended with audiences coming from as far away as Japan and Australia as well as Malaysian Royal Family members. Mark had already met Lance Ellington at Carl’s ‘special’ birthday party at the ‘Ivy Club’ in October 2011, where he also met Carl’s actress wife, Jean Boht. Other silents Mark conducted (for which Carl also gave much helpful advice about his scores) were ‘Wings’ (1927), October 2010 and ‘The Phantom of the Opera’ (1925), October 2015. In February 2012 Mark made his first trip to Granada, Spain, to conduct ‘The General’ (with Spanish intertitles) with the Orquesta Ciudad de Granada at their Auditorio Manuel de Falla, which adjoins the large de Falla archives, managed by his niece, Elena de Paredes. On the other side is the house where de Falla lived for most of his life. The great Alhambra Palace is also very near. Mark returned in March 2013 to conduct ‘Nosferatu’ (1922) with music by the famous hammer horror film composer, James Bernard. Mark was delighted to be invited to make his debut conducting the London Philharmonic Orchestra at the Congress Theatre, Eastbourne (17th March 2013), the same hall and orchestra Mark had been taken to by his grandparents many times as a child.